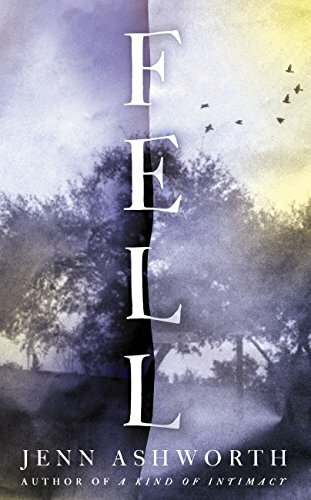 Fell is a hauntingly evocative story, dealing with intergenerational trauma through the topics of drifting and belonging, of feeling at home and of being uprooted. The text employs a narrative voice which is objective yet tinged with longing, grief, and melancholy, and skilfully blends elements of the supernatural into the everyday and mundane. After her stepmother dies, fifty-something Annette inherits the house where she used to live as a young girl, up until the death of her mother. Her return stirs up something in the house: the spirits of her parents awaken from their timeless sleep by the presence of the daughter. Annette's parents – Netty and Jack – refer to themselves in their current state as "we" – as if death had blended them together: they are never apart, they see and think together. They are the narrators of the text, and they are not only able to follow their daughter around in the house and the town in the present, they can also return to the summer of 1963, the summer of Netty's death. Switching between the two timeframes, the reader learns that the long-abandoned house is in a derelict state, damp, cold, hardly fit for human use, its very existence threatened by two overgrown trees – two sycamores, after which, ironically enough, the house itself was named long ago. This is in complete contrast with the past: the parents were extremely keen on maintaining the house, as their livelihood depended on it: they had lodgers (mostly young men), whom they looked after. Gradually, it is revealed though that this has become a more than burdensome task, sucking vitality out of their lives, their marriage, eventually draining all energy out of Netty, who is about to give up resistance to the incurable disease which attacked her body. Annette in the past is a terrified, lonely child, left without explanations as regards her mother's illness. In the present she is so overwhelmed by her current situation – without money or relatives, 'living in a building dissolving around her' – that she regresses into a helpless, child-like state, most apparent when she begs the tree surgeon to destroy the trees. Netty and Jack, in their early forties, are equally lonely: Netty in her illness, Jack in his futile attempts to ease her pain and make life more tolerable. Their joyless, hopeless existence is shattered with the arrival of 19-year old, charming, irresistible Tim, butcher's apprentice and mysterious "healer". With one stroke he cures Jack's eyesight, so Jack persuades him to stay with them and help Netty recover. Even though he is reluctant to start the 'treatment', Tim's presence brings excitement and hope into their life. For the reader, he appears to be a manipulator: "How can he joke around like this when he's just looked through her skin and into the most secret places of her body", Netty wonders as Tim "X-rays" her. We see how Tim's charm works on the family (he is 'a solid ball of pure sunshine they all orbit around'), but for a long time not the charm itself. Only when the narration shows a bit more about Tim's past and his "ability" – one he cannot control and which he regards more of a curse than a blessing –, and after the reader witnesses his compassion for Annette will it be possible not to see him as a freak, and recognize his humanness. The two parallel story lines and time frames allow the author to investigate subjects such as belonging, intrusion, family and loneliness, illness and healing. There are scenes mirroring each other, the most memorable at the beginning and end of the book: the eerily beautiful moments of returning to awareness, and regaining language, and of letting it go again. The rich layers of the book invite different interpretations: the book can be seen as a modern retelling of the myth of Baucis and Philemon, but also as a belated coming-of age-story for Annette: healing from her traumas, she can finally leave her dependent, child-like old self behind. Nature and landscape are another unforgettable aspect of the novel: the salt marsh of Morecambe Bay will be engraved in the mind of the reader, just like the mesmerizing image of the two sycamores as they slowly devour the whole of the house. This all exudes a bleak, sombre atmosphere, sometimes reminiscent of Wuthering Heights in its savagery (the scene of the dead rabbits creates an actual link between the two texts). Yet empathy ultimately overrides cruelty: the gentle narrative voice, full of sorrow for things which cannot be undone, emphasizes forgiveness, and underlines the redeeming power of compassion.